Fall is my favorite time of year for salads. Although they are considered a "spring" food perfect for those pre-bathing-suit months, fall harvest is when all the really good stuff is available for putting on top of salads: squashes, sweet potatoes, apples, and pears. This is one of those fall salads - juicy, crunch, and a little sweet. Prepare a large sheet of parchment paper or foil for cooling pecans. Stir sugar, oil, and vinegar in a large skillet over medium heat until sugar melts and syrup bubbles, about 3 minutes. Mix in pecans and stir until nuts are toasted and syrup coats them evenly, 5-6 minutes. Turn nuts out onto prepared parchment paper and separate using 2 forks. Cool completely. Nuts can be prepared way in advance (up to 1 month) and stored in an airtight container. In a small bowl mix lemon juice, balsamic vinegar, and Dijon mustard with a fork until well blended. Pour in the olive oil in a slow, steady stream whisking constantly. Whisk until well combined. Season with salt and pepper. Put the greens into a big bowl and toss with the dressing and salt to taste. Only use as much dressing as you need to coat the greens lightly (otherwise the acid in the dressing will wilt them). 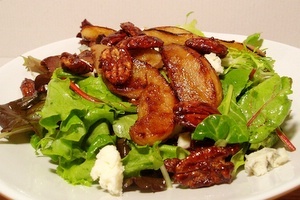 Arrange salad on plates, top with pears, pecans, and cheese.